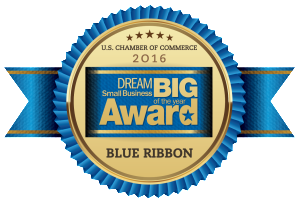 For the fourth year in a row, Geeks and Nerds has been named a winner of the U.S. Chamber of Commerce’s DREAM BIG Blue Ribbon Small Business Award®. This award annually recognizes 100 companies for their success and their contributions to America’s economic growth and vitality. Winners were selected from a record number of applicants from communities across the nation. They were judged in four key categories: strategic planning, employee development, customer service, and community involvement. The state of Alabama was well represented by having six companies in the top 100. GaN Corporation would like to congratulate the other winners from the Huntsville area: LEAN Frog Business Solutions, Inc; nLogic; and PROJECTXYZ, Inc.